First one: A vendor displayed a pink coloured dress in an ecommerce website and that was awesome. I decided that i would wear it in the party and bought all the matching accessories, and then i ordered that dress on that ecommerce website. There might be certain reasons for sending of wrong dress. But, as a customer i was not in a mood to know the reason because i had to face that problem when i needed the party dress most. Similarly, some salespersons promise many things at the time of talking to clients but they fail to fulfill that. If you have promised of a good service that may be in terms of content writing, designs, logo designs, etc but if you don’t have that, then at least hire somebody who can do that for you. Don’t speak of customized website and give a boring copy paste websites. Fulfill the promise which you have made with your client. That will create the trust. I got what i have ordered and being a happy creature i always will seek to buy products from that site. And i will discuss this with my friends and now they also will order products from that site. Now you have observed these two situations clearly and you might have got idea about what i am going to say. When i discussed about the amazon prime with my friends in the second situation there i did brand building of that product without my knowledge. And by providing product on time amazon built my trust. So, by building the trust among customers a company can build its brand value. 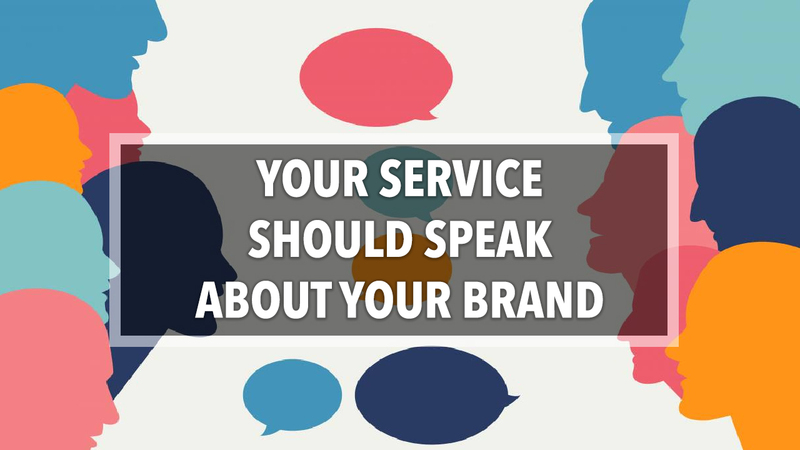 Let our service speak louder than, what our salesperson says. In my earlier company, our company website was not that impressive we were about to change its designs. Meanwhile our business head approached a lead who is in need of web designs for his business needs. When my Head spoke to him, the only thing he said is “ first you focus on your website design then approach us”. Well he was bit rude to say that but at the end of the day we got his point and keeping our egos at bay, we have to accept it that he was right in actual. And we corrected it. We once went to Interior design company for client meet, we got mesmerised with the designs that are of international level. It was something new in market, he build his office in such a way that anybody would get attracted with his out of the box ideas. This shows that how good he is at interior designing. Do the best which you have, If you provide content writing services provide high level content on your website. If you provide web services, do create some innovative website for your company first. The person who have knowledge of good designs will definitely approach you, if you have developed innovative website for your own IT business. Focus on these two areas, you would get what have been seeking for.
" A brand value and good potential leads. "